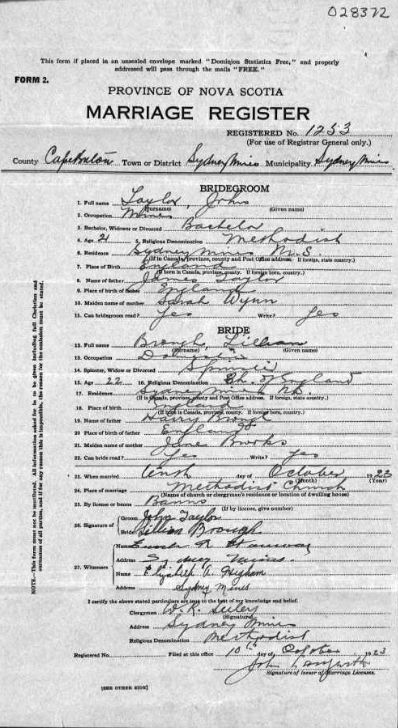 [S2117] Website Family Search (https://familysearch.org) ""Nova Scotia Marriages, 1907-1932," database with images, FamilySearch (https://familysearch.org/ark:/61903/1:1:QVBK-7JHN : accessed 25 August 2015), Charlie Brough and Alice Greenhalgh, 11 Apr 1914; citing Sydney Mines, Cape Breton, Nova Scotia, Canada, p. , Nova Scotia Archives, Halifax, Nova Scotia." [S191] Website Staffordshire BMD (http://staffordshirebmd.org.uk/) "BI/01/011." [S1051] Website Lancashire BMD (http://lancashirebmd.org.uk/) "BROUGH Thomas Henry RIGBY Annie 1913 United Reform Church, Leigh Lancashire Wigan & Leigh A65L/7/33." [S1051] Website Lancashire BMD (http://lancashirebmd.org.uk/) "BROUGH Alice RIGBY 1914 Culcheth Lancashire Wigan & Leigh CUL/70/257." [S1051] Website Lancashire BMD (http://lancashirebmd.org.uk/) "BROUGH Dorothy RIGBY 1918 Culcheth Lancashire Wigan & Leigh CUL/73/423." 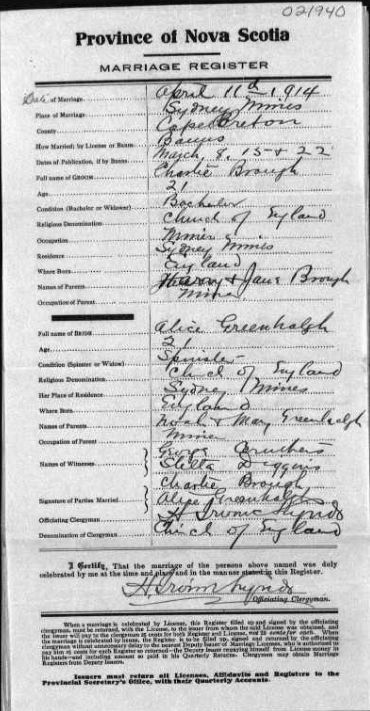 [S2117] Website Family Search (https://familysearch.org) ""Nova Scotia Marriages, 1907-1932," database with images, FamilySearch (https://familysearch.org/ark:/61903/1:1:QVBK-48M6 : accessed 25 August 2015), John Taylor and Lillian Brough, 10 Oct 1923; citing Sydney Mines, Cape Breton, Nova Scotia, Canada, p. , Nova Scotia Archives, Halifax, Nova Scotia." [S1051] Website Lancashire BMD (http://lancashirebmd.org.uk/) "Wigan & Leigh : LOW/25/298." [S1051] Website Lancashire BMD (http://lancashirebmd.org.uk/) "RODEN Zachariah DAVIES Alice 1909 Lowton St. Mary Wigan & Leigh Lancashire C12L/1/211." [S204] Allan Entwistle, "Email from Allan Entwistle (13/3/2003) #2," e-mail to Alan Bennett, 13 March 2003. [S37] Website Cheshire BMD (http://cheshirebmd.org.uk/) "WARR/38/9." [S45] Website FreeBMD (http://freebmd.rootsweb.com/) "Deaths Mar 1867 Edelsten Joseph Baxter 55 Warrington 8c 143." [S1088] Website Lancashire OPC (http://www.lan-opc.org.uk) "Marriage: 11 May 1855 St Paul, Warrington, Lancs. 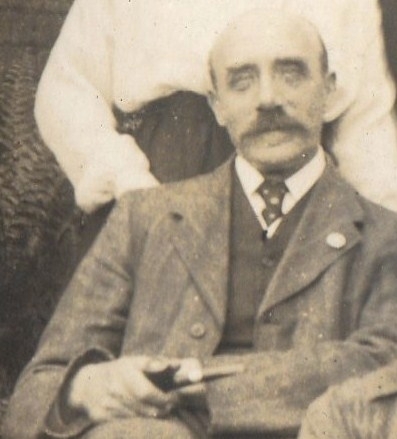 [S2117] Website Family Search (https://familysearch.org) ""England Marriages, 1538–1973 ," database, FamilySearch (https://familysearch.org/ark:/61903/1:1:NNQ4-YLJ : 10 December 2014), William Garnett Bennett and Mary Ellen Warburton, 28 Apr 1859; citing Christ Church, Eccleston (Near Prescot), Lancashire, England, reference item 19 p 114; FHL microfilm 1,657,566." [S40] UK National Census for 1851 for UK, "HO 107/2164 f175 p20 66." 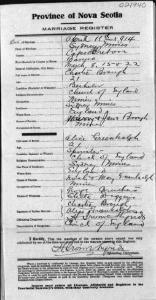 [S49] UK National Census for 1881 Index, UK "RG11/3796 f108 p13." [S48] Online index to the UK National Census for 1901 for UK "RG13/3513 f34 p11." [S37] Website Cheshire BMD (http://cheshirebmd.org.uk/) "WIN/6/44." [S70] General Record Office Indexes "HAYES Altree Harrison Warrington.8c 177 3 1886." [S49] UK National Census for 1881 Index, UK "RG11/3794 f80 p12." [S70] General Record Office Indexes "ONES, HERBERT CONWAY CONWAY GRO Reference: 1863 J Quarter in WARRINGTON Volume 08C Page 138." [S601] UK National Census for 1881 for UK, "RG11/3794 f80a p12 61." 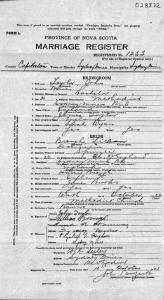 [S56] Index to unknown record type, unknown second location, unknown period "JONES Herbert Conway of Conway House 98 St Georges Road Wallasey Cheshire died 27 November 1937 Liverpool Probate Liverpool 17 February to Stanley Conway Jones schoolmaster and Harold Ivan Jones bank manager. Effects £9699 9s." [S70] General Record Office Indexes "Death Dec 1837 JONES Herbert C 74 Liverpool South 8b 100." [S37] Website Cheshire BMD (http://cheshirebmd.org.uk/) "Warrington : LAT/15/72." [S37] Website Cheshire BMD (http://cheshirebmd.org.uk/) "Warrington : R51/100." [S70] General Record Office Indexes "JONES, HAMILTON SEYMOUR CONWAY GRO Reference: 1858 M Quarter in WREXHAM Volume 11B Page 289." [S49] UK National Census for 1881 Index, UK "RG11/3793 f5 p4." [S37] Website Cheshire BMD (http://cheshirebmd.org.uk/) "WAR/47/309." [S2] UK National Census for 1871 for UK, "RG number: RG10 Piece: 3903 Folio: 156 Page: 44." [S48] Online index to the UK National Census for 1901 for UK "RG13/3585 f84a p16 108." [S372] Paul Dwerryhouse, "Email from Paul Dwerryhouse (23/11/2003) #1," e-mail to Alan Bennett, 23 November 2003, Jabez Plinston Family Tree. [S70] General Record Office Indexes "Deaths Mar 1943 PLINSTON Edwin 79 Warrington 8c 176." [S372] Paul Dwerryhouse, "Email from Paul Dwerryhouse (23/11/2003) #1," e-mail to Alan Bennett, 23 November 2003, Family Report for William Plinston and Ellen Dagnall. [S72] UK National Census for 1891 for UK, "RG12/3075 f4 p1 2." Jabez had a brother John whom my wife is descended from. [S372] Paul Dwerryhouse, "Email from Paul Dwerryhouse (23/11/2003) #1," e-mail to Alan Bennett, 23 November 2003, Notes on William Plinston by Frank Anthony Plinston. [S37] Website Cheshire BMD (http://cheshirebmd.org.uk/) "C25/3/7." [S371] Marriages Transcript, St Elphin, 1837-1850. [S40] UK National Census for 1851 for UK, "HO 107/2203 f607 p12 50." [S37] Website Cheshire BMD (http://cheshirebmd.org.uk/) "C12/2/145." [S47] UK National Census for 1861 for UK, "RG9/2794 f89 p23 110." [S206] Microfilm Christenings, Bewsey Road Wesleyan Methodist (Warrington), 1875-1923 "812." [S37] Website Cheshire BMD (http://cheshirebmd.org.uk/) "WARR/99/434." [S45] Website FreeBMD (http://freebmd.rootsweb.com/) "Deaths Dec 1898 Plinston Jabez 72 Warrington 8c 130." [S372] Paul Dwerryhouse, "Email from Paul Dwerryhouse (23/11/2003) #1," e-mail to Alan Bennett, 23 November 2003, Grave Search for Grave B.543 Dissenters. [S37] Website Cheshire BMD (http://cheshirebmd.org.uk/) "WAR/25/394." [S324] Microfilm Baptism, Bold Street Wesleyan (Warrington), 1870-1935 "5." [S48] Online index to the UK National Census for 1901 for UK "RG13/3585 f95." [S37] Website Cheshire BMD (http://cheshirebmd.org.uk/) "WAR/34/281." [S37] Website Cheshire BMD (http://cheshirebmd.org.uk/) "BK58/3/277." [S37] Website Cheshire BMD (http://cheshirebmd.org.uk/) "WAR/42/451." [S37] Website Cheshire BMD (http://cheshirebmd.org.uk/) "WAR/60/365." [S37] Website Cheshire BMD (http://cheshirebmd.org.uk/) "WAR/64/434."